Daratumumab-based therapy has been shown to have significant clinical efficacy in phase 3 trials of patients with relapse or refractory multiple myeloma. Outside of clinical trials, however, clinical data on daratumumab remain limited. We reviewed medical records of patients who received daratumumab combination therapy at our institute (median age 74 years; median lines of prior therapy 4). The overall response rate was 69.4%, and 36.7% of patients achieved complete response (CR) or better. The proportion of patients who attained CR or better was significantly higher among patients with < 4 prior therapies than those with ≥ 4 (56.5% vs 19.2%, P = 0.009). Estimated median progression-free survival (PFS) was 12.4 months (95% confidence interval 8.6—not reached). The median PFS was significantly worse in patients who were refractory to bortezomib and lenalidomide and had received ≥ 4 lines of prior therapy. Twelve of 49 patients attained negative minimal residual disease. 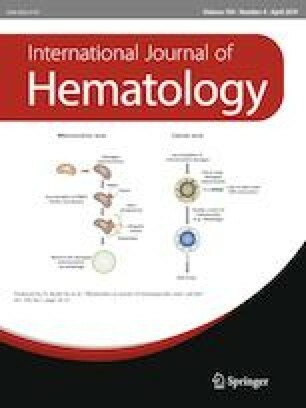 Common adverse events included hematological toxicities including neutropenia and lymphopenia; however, the rate of febrile neutropenia was low (3.8%). Infusion-related reactions occurred in 32.1% of patients, but were grade 1 or 2. Daratumumab combination therapies therefore appear to be effective and safe as salvage regimens in clinical practice, especially when used in the early phase. HK, TT, and KM planned and designed the study, collected the data, and wrote the manuscript. HK, KM, TT, TT, YA, DM, KN, AK, and MT performed patient care. All authors reviewed the manuscript. The manuscript was edited and proofread by Editage (www.editage.jp). This study received no specific grant from any funding agency, either public or commercial.